If there's one thing you should know about me it's that I love coffee and my favorite (seasonal and tropical fruit) is coconut. Mix these two things together and I will be one happy gal. 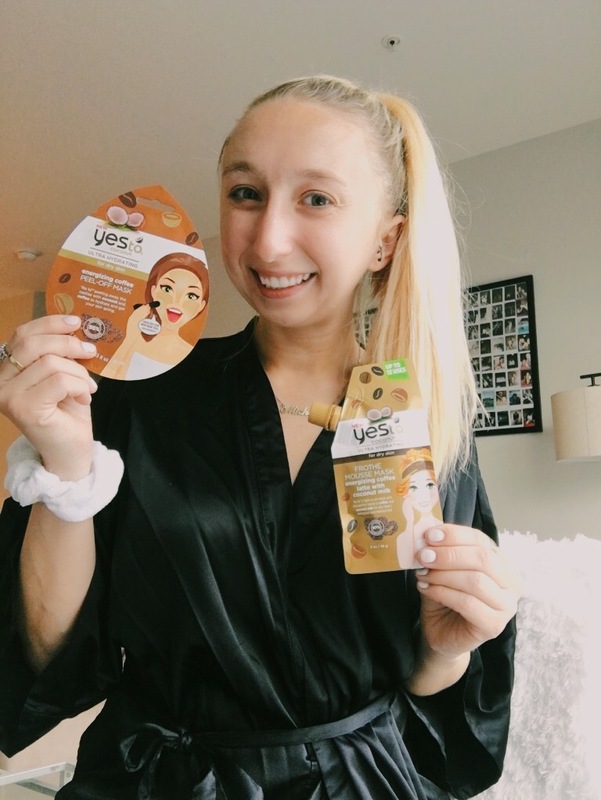 So when I received this package from YesTo I was beyond excited to test out these products right away! 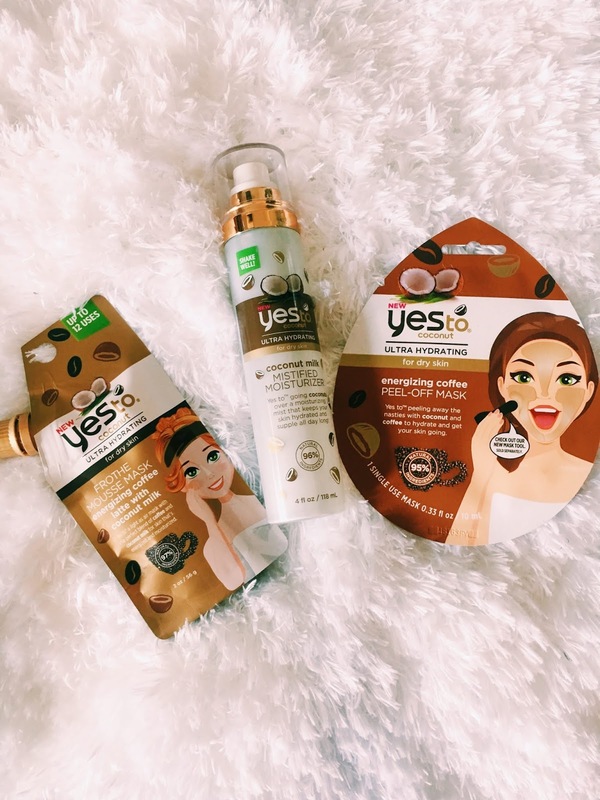 I'm working with YesTo today to share the new Coconut + Coffee collection which is formulated with coconut milk for ultra-luxurious hydration and caffeine which gives that perfect boost of energy to your skin. The first thing you can't help but to notice is the amazing packaging. I'm always seeing these standout to me on my Target runs, common ladies, you know what I mean! I'm always gravitating towards this brand because not only are the products great for your skin, but they're so affordable! 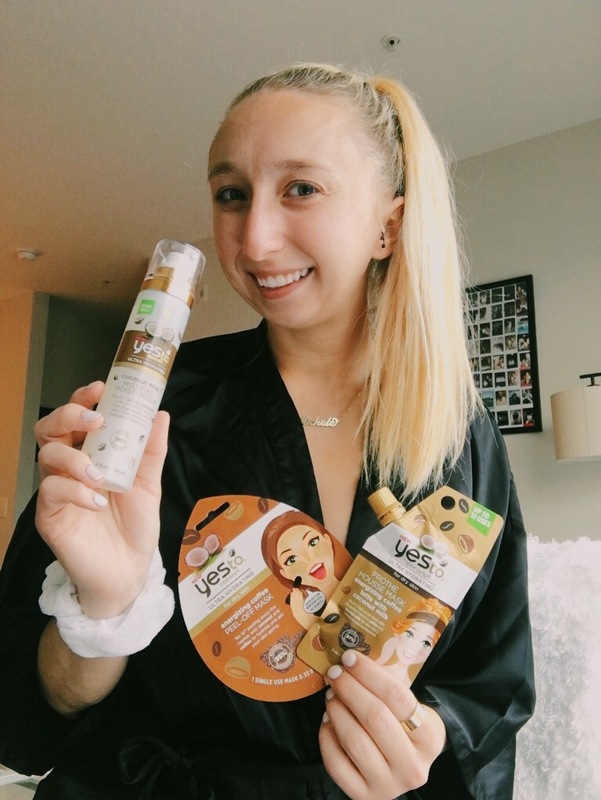 In my package I received the brand new YesTo Coconut Collection which includes the Energizing Coffee Peel-Off Mask, the Moisturizing & Refreshing Dry Shampoo Wipe for Blondes, the Energizing Coffee Latte with Coconut Milk Frothe Mousse Mask and the Coconut Milk Mistified Moisturizer. I mean, how incredible do these products sound? The two products that really caught my attention was the Moisturizing & Refreshing Dry Shampoo Wipe for Blondes– a dry shampoo wipe?? Perfect for someone on-the-go and the Energizing Coffee Latte with Coconut Milk Frothe Mousse Mask– it just sounds delicious. I had a pretty jam-packed weekend including photoshoots, adventures in D.C. and a soccer game. These products came just at the right time. I spent all weekend testing out these products on different days and different situations and here's my honest review on each one! I used this mask on Friday night to prepare for the next day. On Saturday I had planned an all-day photoshoot and adventuring to D.C. for the Cherry Blossom events. I needed to give my skin a boost and clear out anything left on my face from the work week. The first thing I noticed when I opened the package was the smell. It smelt divine! Maybe it's because I'm a coffee + coconut lover, but seriously this face-mask smelled delicious. Normally I don't care for peel-off masks. Don't get me wrong they're really conveinent and less messy, but I don't really feel like they "clean" my face like a wash-off mask does. This peel-off mask was no exception. It smelt great, it was fun to use and easy to take off, but my skin didn't feel any different. Again, I'm just someone who prefers mud masks and the peel-off mask was great to use since I was busy getting ready for the next day. Okay, I won't lie, I was very excited to test out this product. I wanted this product to be amazing because it's the perfect thing for someone like me who spends long hours at photoshoots and I'm constantly changing up my clothes, my hair, the weather in Virginia is never consistent and you just don't know what they day is going to bring you. I brought this with me when I was running around D.C. all day Saturday. 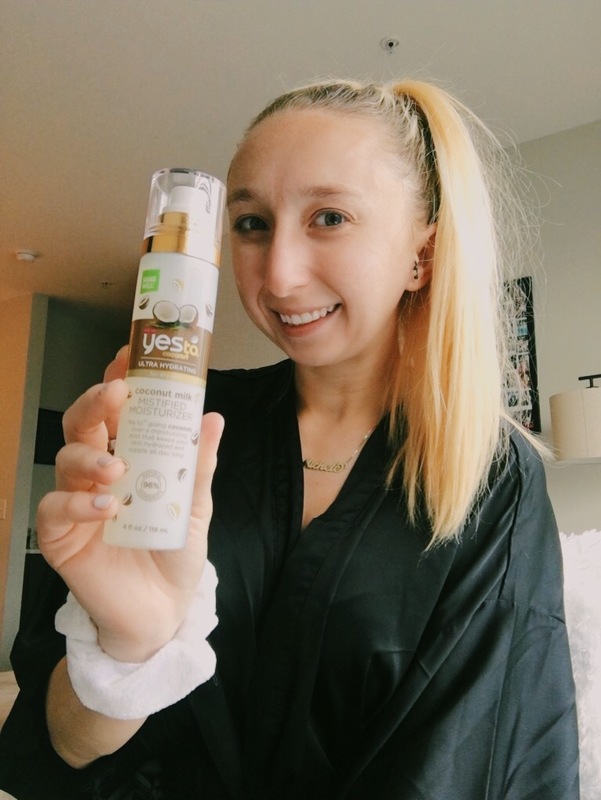 I knew that I would be changing up my hair styles, touching my hair for photos and I knew I would need to use some dry shampoo throughout the day which made using a wipe much more convenient than bringing an entire bottle of dry shampoo with me. I can honestly say, this product surprised me. I wanted to love it, but I was skeptical. This product is amazing! It was extremely easy to use and it was just the right amount of dry shampoo needed and more. I was able to use it so effortlessly and it didn't create a mess by any means. My hair performed perfectly and just how I wanted it to. I do think that the price is a little expensive for a single sheet, but if you're a gal on the go, this may become a staple in your routine. Let me just start by saying, this mask was exactly what I needed after a long day. You'll soon see the severaaaaal different outfits I shot, along with my adventures in D.C. and just the long day I had in general on Saturday. My day started at 8:00 a.m. and didn't end until almost 9:00 p.m. It was a long one to say the least. I had makeup on the entire day, walked around a lot, spent time in a Cherry Blossom festival which (thanks to my allergies) wasn't the best for the skin and when I finally got home I felt greasy to say the least. Even after I showered I knew I needed something for my skin to really clean off all the crap that accumulated on it throughout the day and that's why this mask was the perfect detox. Much like the peel-off mask, this mask smelt incredible. I was already excited about it out before I even put it on my skin! I knew this product was going to be a favorite of mine. I love mud masks and this one was a much needed detox after a long day. If I had to choose one thing form this collection it would be the Coconut Milk Frothe Mousse Mask! This product is something that you have to use more than once to know if you really like it. I used it every night this weekend and am still using it throughout the work week to give you an honest review about it. I actually have combination (oily & dry) skin and I rarely use moisturizers. I find that when I use them my skin just gets more oily and I haven't really found a moisturizer that I like to use. If I do use any moisturizer it's always at night because I'm going to bed so I don't mind if my face is a little oily. However, this product is for people with dry skin and I assume people with dry skin use a moisturizer twice a day (morning & night) so I decided to use it twice a day for several days to see how it affected my skin (someone with combination skin) and how it worked with my makeup throughout my work day. This product isn't what I expected, it was a spray, not a lotion! I thought this was really cool because we all know I love my Mario Badescu Rose Water Spray, so the fact that this moisturizer was a spray was a delightful surprise. I loved the way it made my face feel too! It wasn't sticky or greasy. The only downside of this product was the way it sprayed. It sort of squirted directly and didn't really spritz, if this makes any kind of sense. Aside from that though it was again, another product I was surprised to like as much! 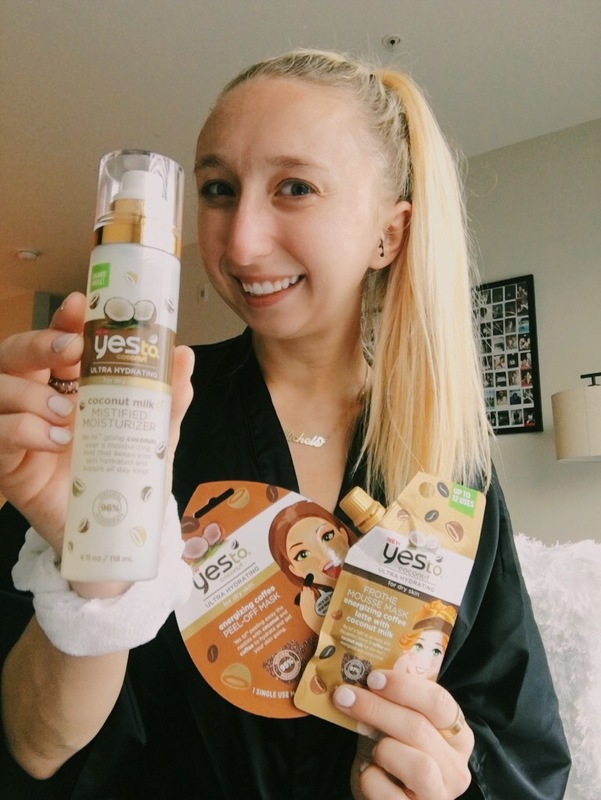 If I had to only choose my favorite products from this collection it would definitely be the Energizing Coffee Latte with Coconut Milk Frothe Mousse Mask and the Moisturizing & Refreshing Dry Shampoo Wipe for Blonde. I think these two products performed the best with my skin and I really felt and noticed a difference after using it. These products are designed for people with more dry skin, so it may perform differently with you than it did with me, but these two products get gold stars in my book! There it is, my final review on the new YesTo Coconut Collection. This collection is definitely one of my new favorite from YesTo, even though it doesn't beat out the Charcoal Collection in my opinion, but it's pretty close. I really hope this collection sticks around (even though I find most coconut collections don't, which is really sad for me) because this is definitely something I will be repurchasing again. The YesTo Coconut Collection is out in stores now. If you try out the new collection let me know your thoughts by commenting down below.